This was a beginning apparel construction class. So the projects were pretty basic up until the last project, a short-sleeve shirt with a camp collar. The class did gave me the opportunity to learn how to use industrial sewing machines with a professional instructor, as well as learning some industry techniques for some sewing tasks such as installing zippers. And I also learned some important hand-sewing techniques, just in the nick of time for Tailoring. Edited to Add: a photo of the camp collar shirt. Camp collar shirt, sewn in muslin. Buttons were not required for the assignment, which is all a good thing because the shirt doesn’t fit me. An apron I made in Apparel Construction 1. This class was a blast. Lynda Maynard’s fitting technique is based around muslin test garments with horizontal balance lines and grain lines. This is just like Sarah Veblen’s fitting methodology, which I have written before on this blog. But Lynda Maynard’s process is more streamlined in many ways, and she focuses much more on reading the overall balance of the garment, including issues like the proper hang of pant legs which is not well covered in Sarah Veblen’s books. Overall, this class was hugely valuable in terms of furthering my conceptual grasp of fitting. Plus, I left with custom-fit patterns for shorts, pants, vest, jacket, and a peacoat, as well as a vest I made as the final project. Matching vest for the tailored jacket, done as the final project for my Garment Fitting class. This class was a mammoth effort that consumed nearly all of my free time, and required everything I had in terms of sewing skill. But it was so worth the effort. 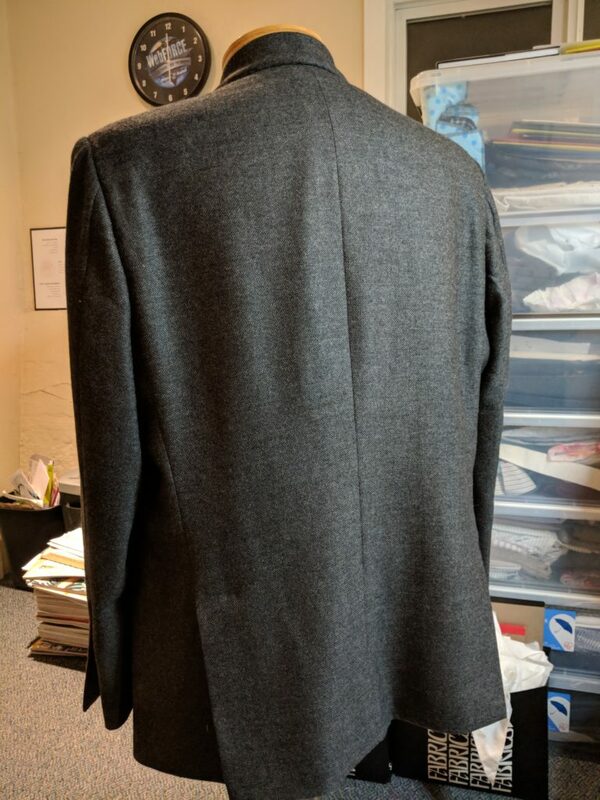 The entire semester was devoted to creating a single tailored jacket, completely done with hand-tailoring techniques. It was a challenge for my instructor (also Lynda Maynard) to cram all the necessary content into a single semester; this could easily have been a two semester course. Out of a class of about thirty students, only three finished their jackets at the end of class. We all gave presentations of our completed jackets or work-in-progress. I have posted updates on this project during the semester on my Instagram feed. 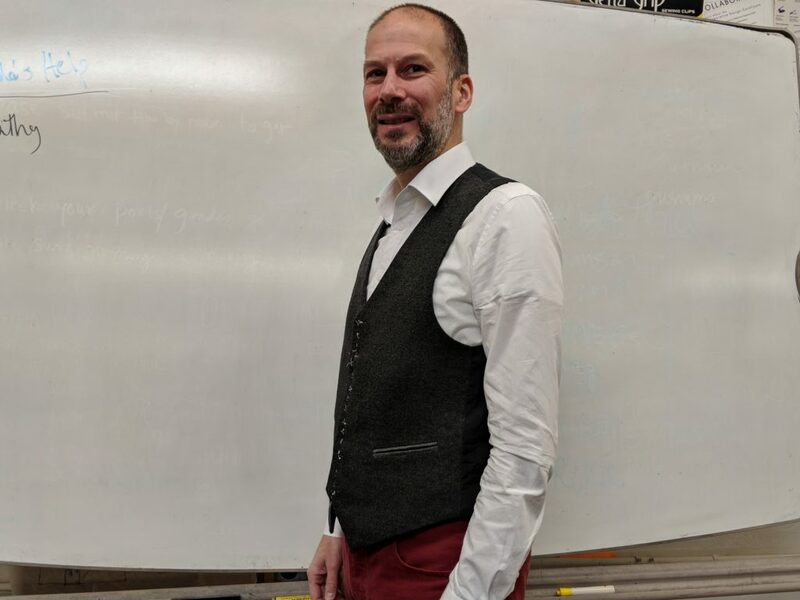 At the end of class, only two significant tasks remained on my jacket: setting the sleeve, and making and installing the collar. I worked through those tasks over most of January, emailing the instructor when I had questions for something that wasn’t clear from the class notes. As of this writing, the jacket is fully complete except for a collar press, buttons and buttonholes, and overall final press. Hand-tailored jacket, front. Ignore the little blue thread that just made friends with my jacket. 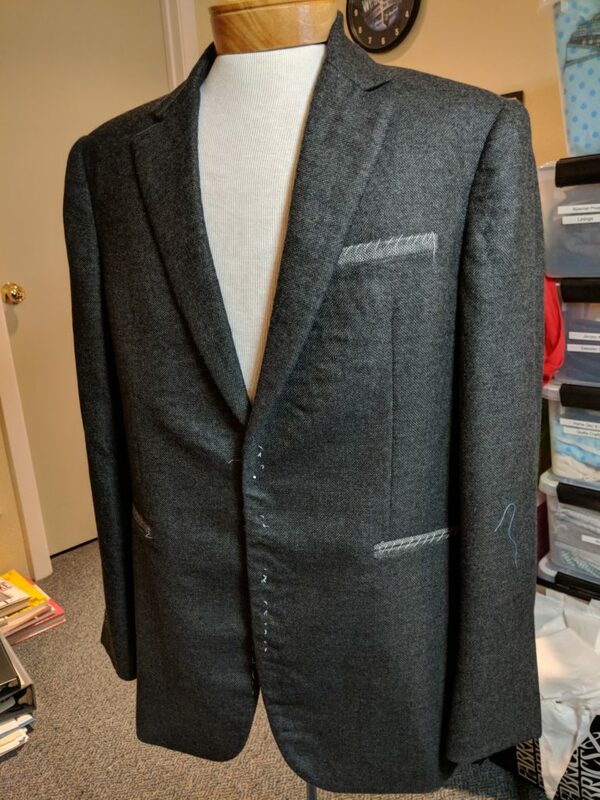 I am going to take the finished jacket to a local tailor to have handwork buttonholes done, then to a local cleaners that is exceptionally skilled in pressing tailored garments. This class has not only broadened my skills, it has changed my perception of sewing. Previously, I was willing to do anything to avoid handsewing. The tailored jacket has tons of internal structure which is all largely handstitched in place. All told it was at least 90% hand sewing, including padstitching, catchstitching, slipstitching, and so many other tasks. Internal structure of jacket, before lining basted into place. Visible is the pad-stitched hair canvas providing shaping and body, internal pockets, as well as the back stay and additional hair canvas at the hems and vents. At this point, all of the canvas and the facings are hand-basted into place. I now better appreciate the advantages of sewing by hand, and will work it in holistically with future sewing projects. I also appreciate the value of couture techniques such as thread-tracing, or marking all stitching lines by hand with basting stitches. 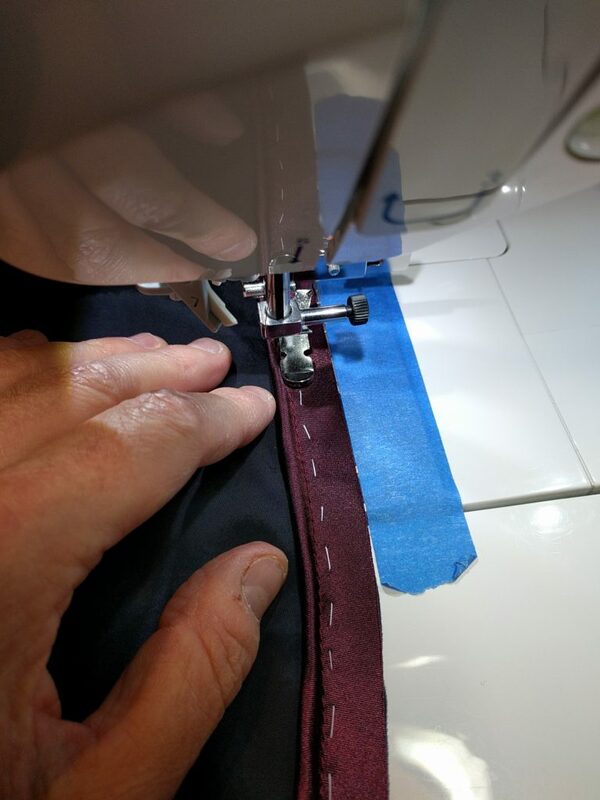 Finally, hand-basting, something I would never have bothered with in the past, is a valuable technique for achieving accurate seams as well as dealing with difficult fabrics. Handbasting piping into place on a slippery rayon lining, before machine-stitching into place. The handbasting worked nicely and doesn’t take nearly as long as you think it would. Finally, I also gained an appreciation for tailoring as a sculptural art. 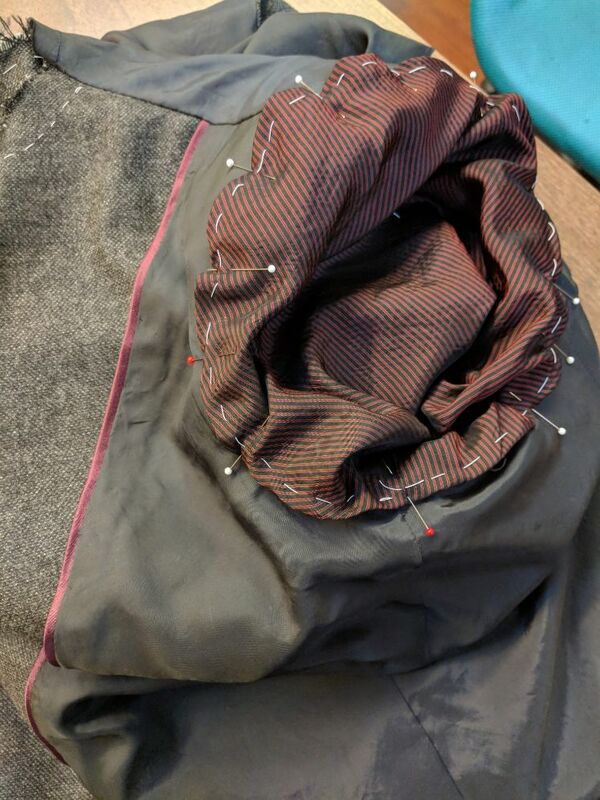 A lot of making a tailoring garment is working with precision – cutting, marking, and stitching accurately, something I’ve learned to do mainly through making men’s shirts. 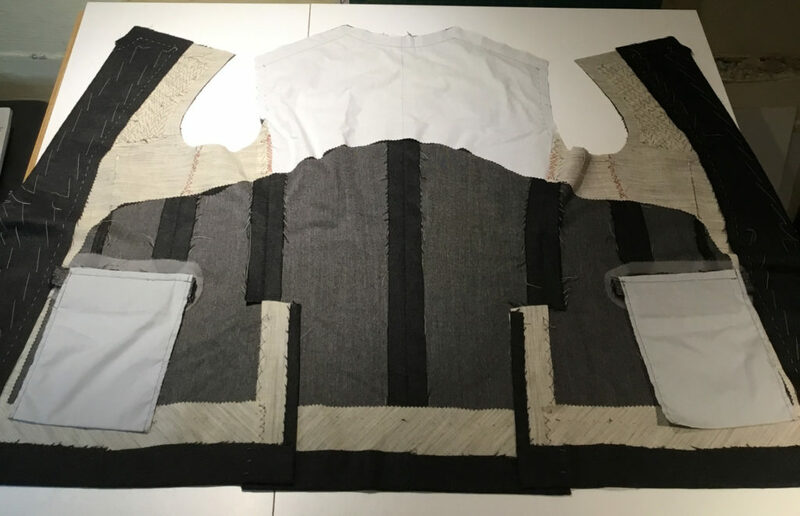 But much of producing a tailored garment isn’t so much working with precision, but molding and shaping the fabric in special ways to make the finished garment look clean and beautiful. Here is one example: to set in the sleeves, you follow seamlines, but you also must shape the sleevecap and ease it out to fit into the armhole beautfully. I had a little north of 1 1/2 inches of extra fabric to ease into the armhole, and getting the sleeve to sit nicely was as much sculpture as it was sewing. I tried measuring the shaped sleeve caps, and the corresponding armhole. And eventually I realized this is a task that can’t be done by numbers, but only by shaping the fabric, basting it in place, and evaluating the combination by eye. Does the sleeve hang right? Are there ripples in the sleeve cap or in the garment along the armhole? If so, pull out the basting stitches, do some more shaping and positioning, re-baste the shoulder and try again. When all is good, then you use the sewing machine to stitch the sleeves into place. Attaching the shoulder pads. At the edges are layers of wool mohair and horsehair canvas to provide shape to the sleeve cap. Handbasting the sleeve lining into place. The pins are removed; the handbasting does the same work without distorting the fabric. Then, the sleeve lining is slipstitched by hand around the armhole. I have a lighter course load this coming spring semester. Currently I am only enrolled in two classes: Apparel Construction 3, an advanced sewing class, and Flat Pattern 1, a beginning patternmaking class. I intend to cover projects in these classes in more detail as we go along. More about my next project is coming soon. Thanks for sticking with me. Another baste-o-holic is born! Your jacket looks amazing. The set of the sleeves is a thing of beauty. You’re so lucky to have reputable places to have your buttonholes and pressing done. After all that work, you certainly don’t want to leave your “child” with a total stranger. Setting in the sleeves was the most difficult part of the project… there were moments of despair, and several attempts before I got something that worked. I know there are some home tailors who love to do their own buttonholes – Jamie of Male Devon Sewing comes to mind. But for now I will leave that to the pros! How you manage your time, focus your focus, and have the patience to trust the process to an artful outcome is amazing. You are clearly determined to get a thorough education in the design and construction of garments. Didn’t see your camp shirt. Wondering why it was challenging. Raglan sleeves? The collar itself? Glad to see your post (you’ve been missed, dontchaknow?). I took a photo of the camp shirt, but I left it out at the last minute because I did a terrible job pressing the shirt for the photo and I didn’t have the patience for a do-over. The camp shirt was unusual because we used french seams for the sides and sleeve seams. The instructor didn’t want us attempting flat-fell seams because students in the past have turned in some hot messes attempting them. 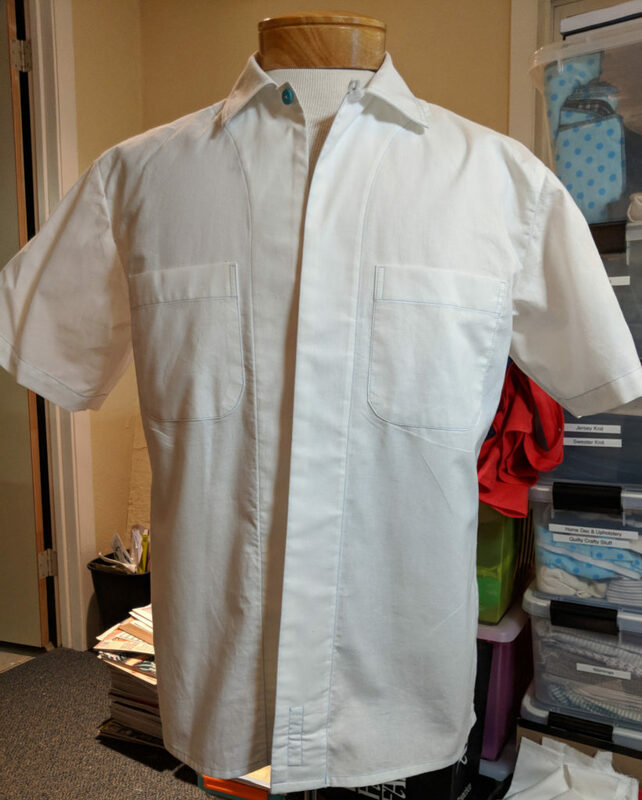 The camp shirt wasn’t more challenging than any other shirt project I’ve attempted, but the most difficult part was getting the facing tacked down. 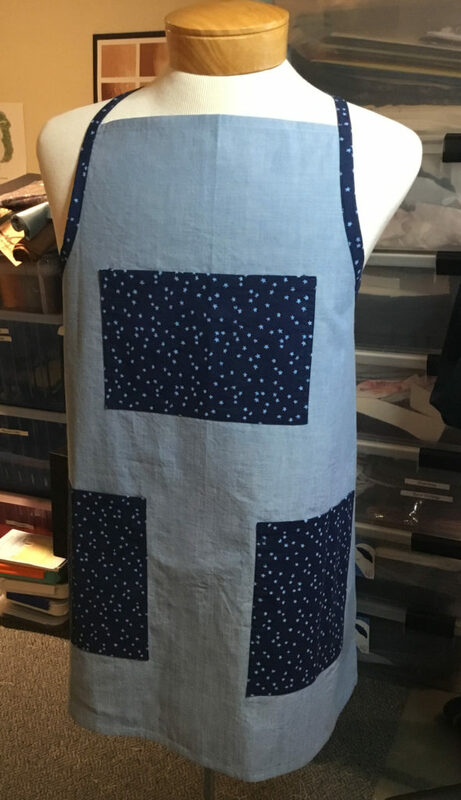 There is a good amount of ease in the neckline facing that must be evenly distributed, and I had to pull seams two or three times until I got something that worked. I have repressed the shirt and reshot its photo, and I have edited the post to add it. How difficult is this Custom Tailoring class? I’ve been eying it for a while now. I’ve been learning sewing informally for a year now — familiar with pattern drafting, can make t-shirts and such. 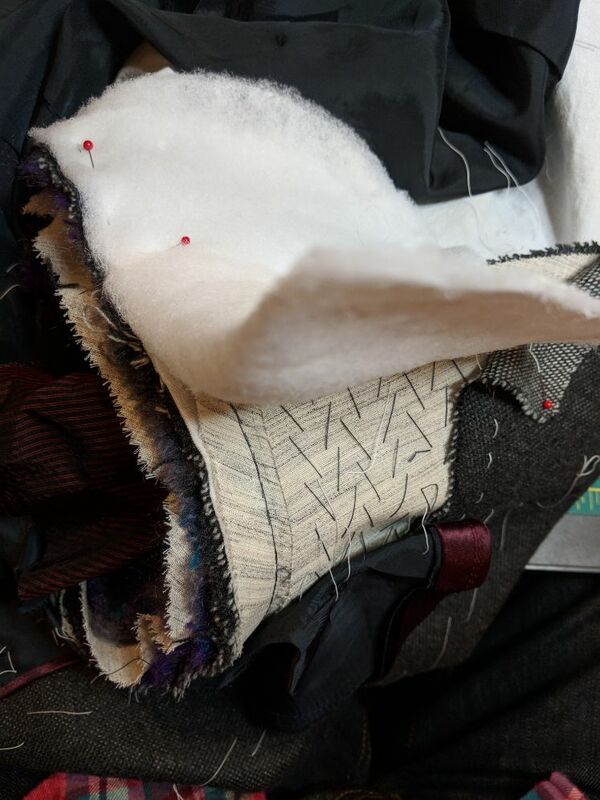 Hi, sorry for missing this reply sooner….If you have a year of informal sewing, I honestly wouldn’t recommend the tailoring class. I had several years of sewing experience, including some fairly complex and intricate projects successfully completed, before I took on tailoring and when I signed up, I knew I was ready.